As well as being in a fantastic location for exploring the Howgills and beauty of the Eden Valley, The Fat Lamb is also ideally located along various walker routes for longer walking holidays as a 'stop off point' on route. 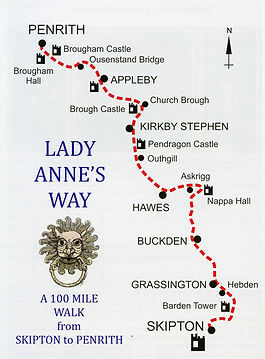 Lady Anne's Way route was inspired by Lady Anne Clifford, that indomitable lady who owned vast estates in the old county of Westmorland during the seventeenth century. Lady Anne travelled repeatedly between her castles and the route takes in these once magnificent buildings, many now sadly in ruins. The 100 mile walk starts at the magnificent Skipton Castle, the Way passes through the beautiful and popular Yorkshire Dales on its way into Cumbria and the hidden delights of the Upper Eden Valley, before finally finishing in Penrith. The Fat Lamb is a little off the route, but we are flexible to collect walkers free of charge from either Kirkby Stephen or Outhgill as long as this service is requested in advance of your stay. In addition, our sister hotel The Kings Arms is located in Temple Sowerby (just after Ousenstand Bridge on the route) so you can enjoy both of our hotels for one night stops on your journey. Both of our hotels are working closely with local holiday providers who will organise walking groups and even transport your luggage for you, leaving you free to enjoy the beautiful scenery and rich history of the walk. Absolute Escapes offer self-guided walking holidays on some of the finest long distance trails in England, Scotland, Ireland and Wales, including Lady Anne's Way.